As the commemorations of World War I approach, I think about the family members who lost their lives in the Great War. Many, many of my ancestors were among the 690,000 soldiers of the Canadian Expeditionary Forces (CEF); a number were among the 67,000 killed and 173,000 wounded — almost 39% of those mobilised. I was particularly touched by the story of Peter Frood (1865-1934), his wife Naomi McEwen (1857-1950), and their family. Peter was my great grandmother Barbara Watt Frood’s brother, my great grand uncle. Even before the War, they had seen tragedy. In 1912, their daughter Iva Ray, a school teacher, had committed suicide. It is hard to fathom their sorrow when, in 1915, they learned that their son Lorne Vine Frood, of H Company, CEF, died in the trenches somewhere near St. Julien, France. 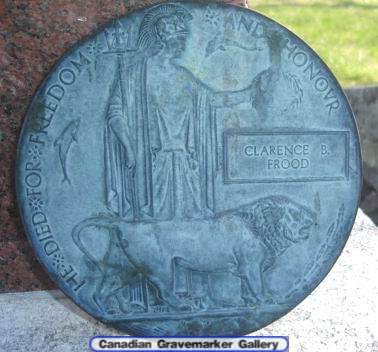 It was soon to be compounded, when news reached them in 1916 of the death, at age 19, of (Clarence) Boyd Frood, 8th Canadian Mounted Rifles, CEF, near Mount Sorrel, France. Their bodies were never recovered, but they are remembered in the ceremony that takes place daily at 8pm, at the Memorial at the Menin Gate, Ypres, Belgium, where their names are inscribed. Sons of Renfrew, their names are also inscribed on the cenotaph outside town hall in Renfrew. One of the plans to commemorate those who died in the Great War is to nightly project the names onto the War Memorials in Ottawa and several other cities across Canada. In the run up to the celebrations of the 100th anniversary, many are reflecting on the meaning of the Great War. I find it hard to think about 10 million soldiers’ and 6 million civilian deaths. Seeing it one family at a time begins to give some sense of the devastation that took place on both sides of the Atlantic.